Park Min Young is playing the character of absolute Lotte girl Yoon Jae In who is naturally cheerful and lively in Glory Jane. The life Yoon Jae In who is originally a sweetie nurse becomes complicated after meeting with Kim Young Kwang. 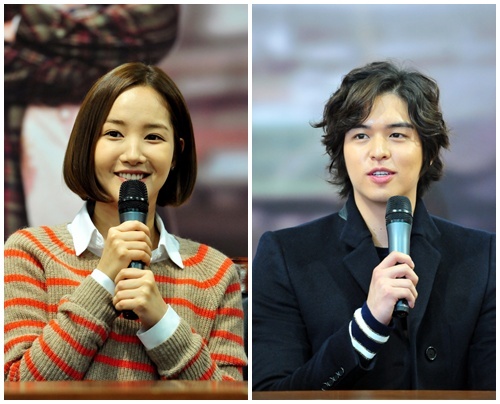 On November 3rd, 2011, Glory Jane production team had an open house with press conference at the filming venue at Cheongju city of Chungcheongbuk-do (Chungbuk province), South Korea, director Lee Jung-seob, Park Min Young, Lee Jang Woo, Choi Myung Gil and others attended the event. When asked about the passionate kiss scene where she was forcefully kissed by Lee Jang Woo, Park Min Young said frankly, “He led very well, one take was enough.” She continued, “He doesn’t have much experience in kiss scene, so initially I still worried about even though I am also not very good, but do I have to teach him. But goodness he’s a good kisser, filmed the kiss scene perfectly. On the contrary, it’s him who led, and the kiss scene was took with a clean cut and no NG.” Provoking the laughters. The Glory Jane which ratings have continuously increased since debut will meet a new opponent next week, that’s MBC miniseries Flower, Me Too. The fierce competition for viewers will soon start.